Memories of the past come crashing into the present in this exciting all-new Aspen mini-series, FATHOM: BLUE DESCENT! Aspen Matthews is the link between the world we know and the world below, but the secrets of her past have always remained shrouded in mystery-until now! FATHOM: BLUE DESCENT journeys back to the life of Aspens true parents, members of the underwater race known as the Blue, and the strife they encountered before she grew to become the woman we know today. An all-new cast of characters-and some familiar faces as well-kick off this exciting premiere #1 issue in dramatic fashion! With FATHOMs return at hand, some new creators and several familiar names are coming along for the ride! Taking charge of the writing chores is David Schwartz, known for his critically acclaimed Image Comics title Meltdown. Art duties for all of Aspens curvaceous lines and intricate environments will be handled by Scott Clark of Stormwatch, Alpha Flight and X-Men fame. Together, this dynamic duo is looking forward to putting their stamp on FATHOM: BLUE DESCENT as never before! 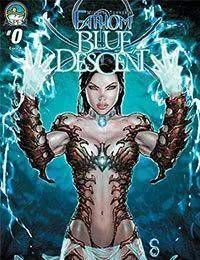 Over a decades worth of answers spill out onto the pages of this exciting, all new FATHOM: BLUE DESCENT mini-series!